We've been calling the little salmon-colored cinderblock building on the north wall of the bus wash the "piano shack" for months now. Now we're pleased to say that we actually have a piano in the piano shack! Thanks to Victor from Allegro Piano Movers for arranging the donation and delivering our new piano! 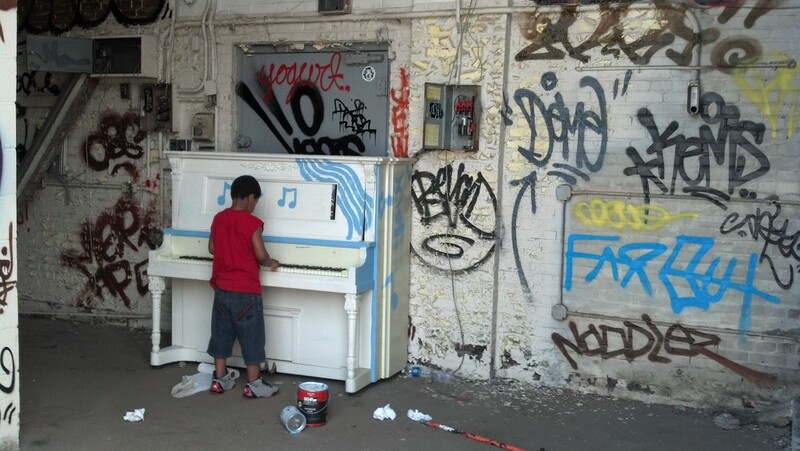 The piano is there for anyone to play, and the fact that it came painted white like a canvas meant that our artists were all over decorating the instrument. A huge thank-you to Victor from Allegro Piano Movers for arranging the donation and delivering the piece. If you've got a piano and need to move it, Victor's your man!